Sophie and Sam is a fashion forward, trendy, affordable brand for little girls. Their focus is to create garments that will last and make your little one look great at the same time. SUITABLE FOR ANY OCCASION - These Beautiful Sweaters can be worn casually or used to add style to your daughters wardrobe. Weddings, Parties, Indoors, Outdoors, Church, School... These Girls' Sweaters can be used anywhere. MAKES A GREAT GIFT - This is the perfect gift for any Girl, there are many colors to choose from and they would add style and spice to any girls outfit. GREAT FOR FAMILY PICTURES - Comes in many sizes including Toddler, 4-6x and 7-16. You can use these Girls Cardigan Sweaters to style up a family portrait or to send out that family postcard to grandma. QUALITY - Sophie and Sam Prides itself on their excellent design and always makes sure the quality will last. Machine Washable. FOR ANY OCCASION - Perfect for school, holiday, communion, party, wedding, church, daily wear, indoors and outdoor. DRESSY OR CASUAL - These adorable and affordable sweaters are a great layering piece to add to any girls ensemble. It can be worn over a dress or over any casual outfit. 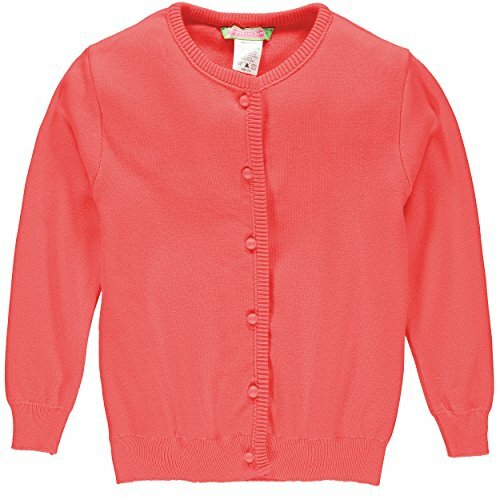 COMFY MATERIAL - This super soft knitted sweater cardigan will be your girls' go to accesory all throughout the year. LONG SLEEVE - These Long Sleeve cardigans will keep your girl warm from the cold weather in the winter and a chilly night in the summer. GIRLS SCHOOL UNIFORM - Perfect addition to her school uniform, a necessity in every school girl's closet. If you have any questions about this product by Sophie and Sam, contact us by completing and submitting the form below. If you are looking for a specif part number, please include it with your message.